A recent study from Toronto’s Solutions Research Group (SRG), shows that even combined, online streaming services Crave TV (owned by Bell) and Shomi (owned by Shaw and Rogers) have one-seventh the number of subscribers that Netflix does in Canada. The survey, part of SRG’s ongoing Digital Life Canada research, received results from 1,000 Canadians through an online panel in April 2016. “SRG estimates that Crave and Shomi have fewer than one million households as active subscribers (combined) or about a 1-to-7 service ratio for these services vs. Netflix,” says SRG, measuring Netflix’s subscribers at an estimated 5.2 million. Unfortunately for the two Canadian streaming sites, the research reveals that a lack of awareness isn’t the issue behind poor adoption. The study reports that 83 percent of those polled at least vaguely know about Shomi, while 78 percent at least vaguely know about CraveTV. 48 percent and 44 percent stated they definitely know about Shomi and CraveTV, respectively. “Adoption continues to lag far behind awareness with 4% [of respondents] reporting current Shomi subscriptions and 3% reporting for Crave,” says SRG. 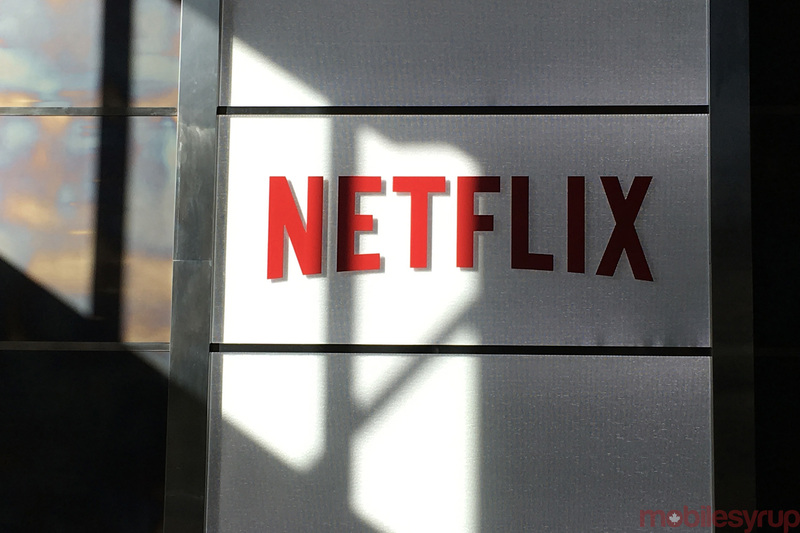 Because Netflix has never released specific numbers on the quantity of its Canadian subscribers, SRG appears to have based its subscriber estimate on the number of respondents who had streamed at least one movie or TV show on Netflix in the past month. However, not all users may be individual paying subscribers, so the numbers might in fact be under the 5.2 million SRG suggests. An April study run by international research firm SNL Kagan estimates subscribers at 4.3 million, but seems to have operated on a similar assumption. SRG notes that while Rogers and Shaw have not made public any subscriber numbers of which they are aware, Bell announced in its Q1 2016 earnings report that it had 100,000 direct to consumer subscribers for CraveTV. Last summer, the company reported 730,000, but this was at a time when it was being freely offered as a promotion. The study also polled awareness on the new CRTC-mandated skinny basic cable packages. Definite awareness was at 34 percent, while 33 percent were vaguely aware of the option. “This is a good level of awareness in a short amount of time based on other marketing awareness benchmarks we have,” says SRG. Skinny basic cable packages may be Canadian telecomm’s last best hope of retaining market share in TV services, as their streaming platforms languish and cord cutting continues to be top of mind for many consumers. “Cord cutting intent has trended up steadily since September 2015 and now stands at an all-time high of 46% (with 21% saying they were ‘seriously’ considering cutting the cord),” says SRG. 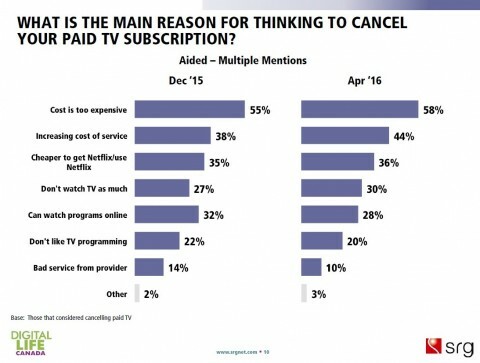 Of the Canadians who did cut the cord, cost was the top factor cited.